Made from a very important Venetian glass factory on the Island of Murano in Venice c1950 these lamps are stylised as classical architectural columns. 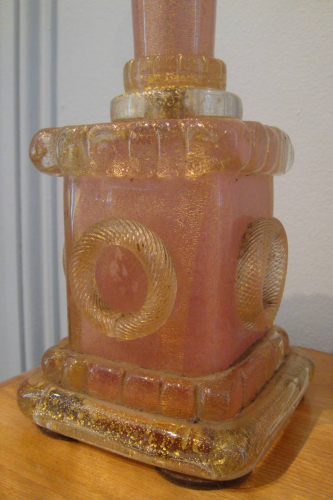 The glass is flecked with gold in the clear and pink sections and is in perfect condition with no chips or cracks. Their is a Barovier & Toso paper label underneath. The height of each lamp to the top of the glass column is 35cm. The overall height including the shade is 61.5cm. They are rewired, PAT tested and certified for UK use.